Over the last day on the campaign trail in the run up to the 2019 Lok Sabha elections, the BJP lived up to the worst expectations of its detractors, unleashing a torrent of Islamophobic war cry in an attempt to whip the public into a panic-driven frenzy, hoping to ensure itself a second term. A GroundXero report. Shah went on to assure the attendees that “All Buddhists and Hindu refugees will be identified and Indian nationality will be given to them,” as promised in the BJP manifesto. On the campaign trail in Assam, despite the reservations of his party’s allies in the region, Modi addressed election rallies in Silchar and Kendukona committing to pass the Citizenship (Amendment) Bill (CAB), a bill that is due to expire this June. The CAB proposes to extend the offer of citizenship to Hindus, Jains, Christians, Sikhs, Buddhists and Parsis from Bangladesh, Pakistan and Afghanistan after a residence of six years in India, and they would not be required to possess any travel documents for this. Significantly, the list of religions does not include Muslims, nor does the list of countries in the CAB include non-Muslim majority neighbouring countries such as China or Myanmar, even though there are several Rohingya refugees fleeing Islamophobic attacks from Myanmar. Together with the NRC registration aimed at identifying Bengali muslims living in Assam as “infiltrators”, the CAB basically ensures a completely selective disenfranchisement of more than 40 lakh Muslim citizens in the state – the largest one-stroke mass disenfranchisement in the history of modern nation states. 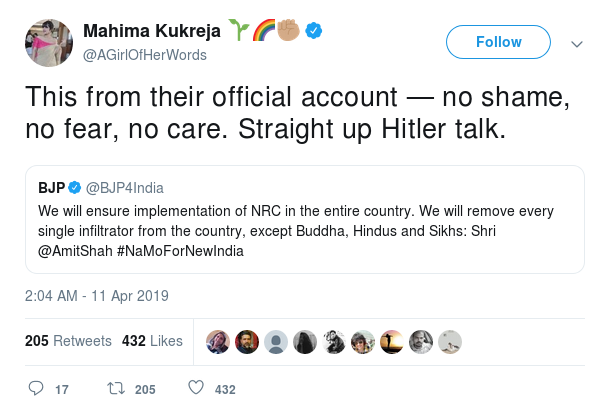 The BJP has also threatened consistently to extend the NRC and the CAB to other border states, including West Bengal. There have been widespread protests surrounding the CAB in the run-up to this general election. Modi promised at this rally to pass the legislation “in consultation with all sections of the people in the state [Assam] and after taking their views into account,” a promise that is likely to fall on deaf ears given the present administration’s history of enacting and enforcing anti-people legislation with utter disregard for what others affected have to say. In the same rally, Modi took shots at Mamata Banerjee, saying he would “chuck out each and every infiltrator.” He alleged that Mamata Banerjee, and more generally the opposition parties, treat these “infiltrators” as a vote bank. 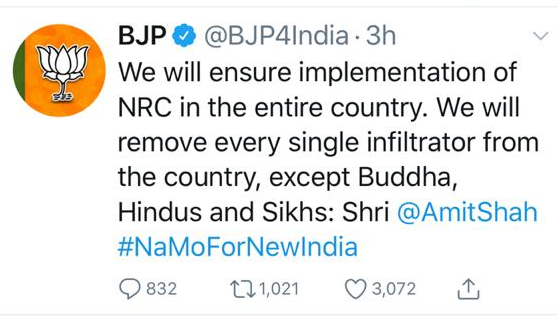 The BJP’s campaign rhetoric blatantly characterizes all Muslim peoples as “infiltrators,” and is thereby patently discriminatory and divisive. The names of Muslim voters, along with those of Dalits and women, have allegedly been disproportionately struck from the electoral rolls: this is mass disenfranchisement and voter suppression, in flagrant violation of the Election Commission’s (EC) Model Code of Conduct. This is just one of a panoply of Model Code violations that the BJP has been accused of in these elections. 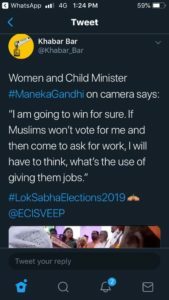 As if this parade of horrors wasn’t enough, seven-time Member of Parliament and sitting Minister of Women and Child Development Maneka Gandhi at a rally in Sultanpur today opted to appeal to Muslim voters by threatening them, essentially arguing that if they did not vote for her in the upcoming elections, they shouldn’t expect her to address growing concerns of unemployment. Her statements imply that employment is a quid-pro-quo. 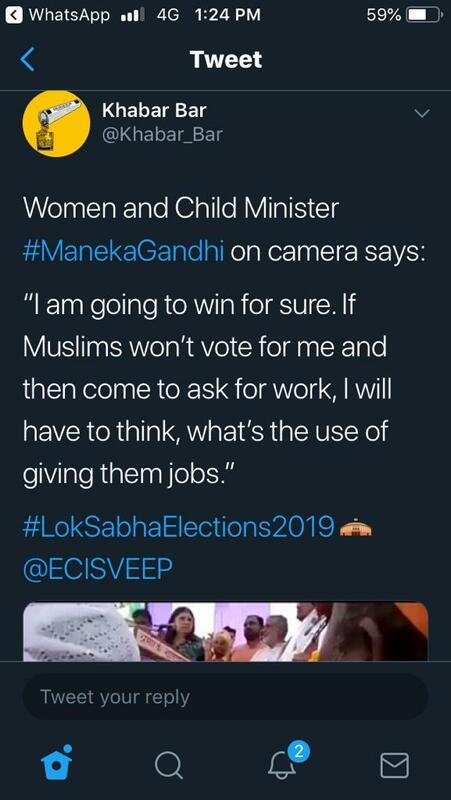 Makena Gandhi seemed very confident that she would win the upcoming elections irrespective of the Muslim vote, and that even if they did vote for her it would be akin to “daal pe chaunka [cherry on top]”. The incessant hate-mongering and hostility to Islam and its followers — the second largest religious community in India — has taken center stage in the country over the past few weeks, as an expected culmination of the last 5 years of Hindutva terror. The BJP has blatantly violated all norms of legality and decency in their campaign, while the Election Commission has largely watched in silence. This trend is in sharp contrast to the neoliberal “development agenda”, and its euphemism “Gujarat model”, that the party had aggressively pushed during the 2014 Lok Sabha elections. This “development” is, of course, near non-existent: the workforce is shrinking, unemployment is at a 45-year high, and the government’s egregious attempts at suppression of National Sample Survey Office (NSSO) data has received widespread condemnation. Their persistent attacks on the autonomy of Constitutional institutions — from the Reserve Bank of India to the Supreme Court to the EC — have received widespread criticisms. Instead of countenancing the genuine and widespread grievances of the people, the Government has elected to base its entire campaign on igniting fear, hatred, and animosity. As sitting ministers of the country, including the Prime Minister, went on their tirade of blatantly discriminatory, unconstitutional, and divisive statements in the last desperate attempts to seal victory, the civil society and common people took to Twitter through the day condemning the hate campaign. 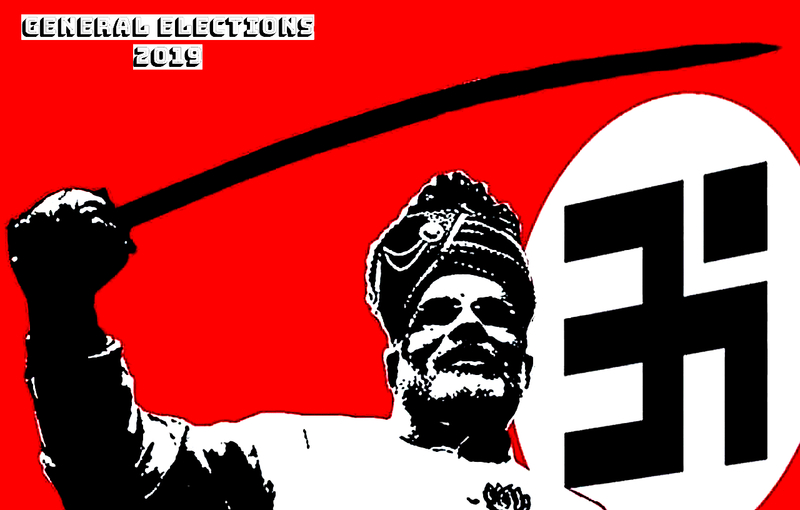 Many described these attempts as Indian ‘Nazism’, and called out to the general electorate of the country to stay vigilant of these disturbing attempts at sabotaging one of the last remaining democratic rights of citizens of this country – the right to vote. 1. Download ECI’s official app called cVIGIL on your smartphone, and use it to file complaints. The App has provisions for anonymous complaints. 2. You can also report on twitter. The ECI’s official twitter id is @ECISVEEP.